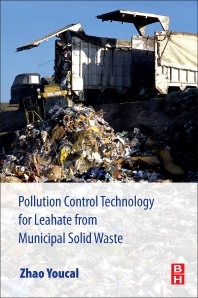 Pollution Control Technology for Leachate from Municipal Solid Waste explores the physical, chemical and biological factors that produce leachate and technological solutions for its control. The book introduces the integrated and pre-treatment leachate treatment processes that are necessary to deal with the variations of pollutants in leachate. Real world case-studies are provided to illustrate these treatment processes, along with leachate treatment engineering process design and the construction of municipal solid waste incinerator power plants. This book will be of particular interest to Civil, Chemical and Environmental Engineers, but will also be ideal for Environmental Scientists. Includes physical and chemical treatment processes for leachate, including ammonia nitrogen removal using struvite precipitation, crystal variation and microstructure of the struvite, etc. Zhao Youcai was born on 11 July 1963 in Fujian Province, China, and has served as Professor of Environmental Engineering at the School of Environmental Science and Engineering, Tongji University since 1995. He received his bachelor degree from the Department of Chemistry, Sichuan University in 1984, followed by a Ph.D. from the Institute of Chemical Metallurgy (now the Institute of Process Engineering), Chinese Academy of Sciences, Beijing, in 1990. He has authored or co-authored over 98 journal publications. His research interests include municipal solid wastes landfill and incineration, waste recycling and reuse, sewage sludge dewatering and sanitary landfill, anaerobic digestion of organic wastes, bio-hydrogen production, cleaner production of zinc, hydrometallurgical treatment of electric arc furnace dust and MSW incinerator fly ash, and treatment of electric and electronic devices and appliances.